Following decades of marathon airings on cable, the holiday movie classic, "A Christmas Story" will forever be associated with Cleveland, Ohio. Only recently has the house, used in the filming, opened to tourists. Yet it has already rapidly risen to the top of must-see Cleveland attractions. However. a visit to Ralphie's ancestral home is only half the story. Cleveland movie magic: A Christmas Story house. 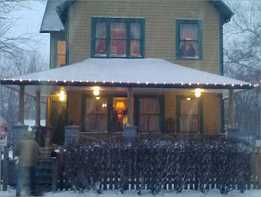 • Visit the "A Christmas Story" house at 3159 W. 11th St. in Cleveland where the classic movie was filmed. The tour comes complete with the iconic leg lamp in the window, and other props from the movie, plus maps & directions to the famous "fa ra ra ra ra" Chinese restaurant. • Discover the world's largest indoor train display at EnterTRAINment Junction in West Chester, Ohio featuring 90 trains, two miles of track, an interactive play area, the American Railroading Museum, and seasonal walk-throughs decorated for the holidays. • The Kirtland nativity exhibit in Kirtland, Ohio features more than 600 crèches from 30 countries depicting how the nativity scene is depicted in cultures around the world. The unique collection ranges from handmade pottery, wood and metal to recycled newspapers and even crafted Coca-Cola cans. Lolly the Trolley Holiday Lights Tours - All aboard to see Cleveland aglow in holiday lights plus special tours to the Christmas Story House, including tour schedules and ticket information. Cincinnati Zoo Festival of Lights - A winter fantasyland with millions of lights, Christmas carolers, childrens activities, reindeer, train rides and seasonal entertainment with the complete schedule and ticket information. Dayton Holiday Festival - View the Grande Illumination and the Dayton Children's Parade along with animated shop windows, holiday music and entertainment. Springfield Holiday in the City - The lights! Holiday festivities! And lots more information on Springfield Christmas hoopla with this year's complete schedule, photos & directions.